The Report Card is a specially designed SchoolCity SUITE module purchased separately by the district, and designed in collaboration with the district. Standards-based grading statements and grading rubrics are variable depending on the district needs. Users can enter grades by student and/or by subject. This document will review how to enter grades by subject. Please refer to the Help document, View/Print/Enter Grade By Student and Enter Comments for more information on completing the Report Card. Or, from the Launchpad, click on the REPORT CARD Flip Card. On the flipped side, select Enter Grade By Subject. In the Report Card screen, the By Subject tab should be selected and highlighted in orange. Note: Students whose report cards were marked complete in the Edit by Student page cannot be changed here. Return to the Edit by Student page and uncheck the marked complete checkbox. Use the Search box to find a specific student to grade. Select the correct Reporting Period. Select the correct Grade level. Select the Subject to be graded. Select a Section of the Subject. Click on Refresh to view the selected roster of students. Show Inactive Students: These are students who were on your roster at some point in the school year, but have since been removed. A report card may be required. Header with Student ID, Last Name, First Name. Subject/Section Header with Standards statements as determined by the District. Scroll right/left to view all scoring statements. Scroll up/down to view all students. Scoring Rubric as determined by the District. Click Save to save all entered scores. 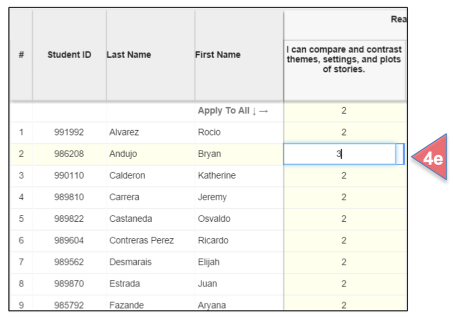 Enter grades for a student by clicking inside the cell in the same row as the student’s name and in the desired column. The row and column you are working in will be yellow. Move from student to student in the same column by using the up or down arrow key. 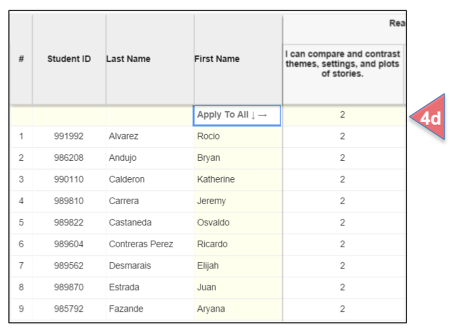 Enter the same grade for all students by entering the grade in the top cell and clicking on Apply To All. Note: This can also be a shortcut for those standard statements that have not yet been introduced. Enter x in the top cell and Apply to All. Change the grade for one or more students by clicking inside the desired cell and entering the correct grade. Edit the entire column by clicking on the top cell, entering a new grade, and clicking on Apply to All. Or to edit a few students, place your cursor on the far right of the top cell, and holding the left cursor, drag down to the bottom student. Click on the backspace key to erase. Then enter the correct grades. Choose new options for Reporting Period, Grade, Subject, and Section, then click Refresh. Follow the same procedures as outlined above. Select the By Students tab to view your entire roster, print report cards, and enter grades by student.